Here are some of the symptoms of celiac disease. If you have these symptoms, check with your doctor for an official diagnosis. There are many other diseases that could be causing these symptoms, as well. Celiac disease can be diagnosed by your physician. They will ask you for a complete family medical history. Then, you physician may order a physical exam and other tests, such as genetic tests, blood test or a biopsy. 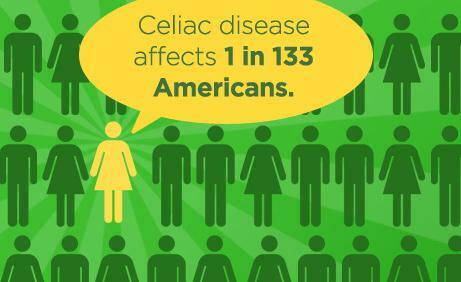 There is no cure for celiac disease. The only treatment is to remain on a gluten-free diet. Following a gluten-free diet will significantly reduce the symptoms of this disorder and may eventually end the symptoms altogether as the villi of your intestines are healed. Eating any gluten at all will restart the damage to your intestine. Therefore, you will have to remain on a gluten-free diet for the rest of your life. In some cases, the damage to the intestines is so significant that eating a gluten free diet will not help. If this happens, the only way to get nutrients is intravenously. Read food labels carefully before eating any food to be sure that it does not contain wheat or any other type of gluten. Some patients with celiac disease can eat oats and others cannot. So, if you have celiac disease, ask your doctor whether or not you should consume oats. Just be aware that packaged oats are sometimes contaminated with wheat. It is also a good idea to pay close attention to over-the-counter capsules, vitamins and tablets as many of these contain wheat starch, which is used as a binding agent in capsules and tablets. Gluten is present in barley so avoid beer. Brandy, whiskey, wine and other alcohols are fine as they do not contain gluten. It is always a good idea to work with a dietitian, who can provide you with more information about a gluten-free diet. When eating in restaurants, you will have to ask what the ingredients are in each dish that you order. Eating just a small amount of gluten will cause some people with celiac disease to vomit or have severe diarrhea that lasts for hours. Even though you have celiac disease, you can still enjoy a healthy diet. You can get pasta and bread that are made from other types of flour, such as rice flour. In addition, many food companies have significantly increased their gluten-free offerings over the last couple of years as gluten-free has become quite popular. In addition, you can enjoy fresh vegetables, fruits, fish and meats, as long as they have not been artificially processed. Sarcoma is a very rare form of cancer. It is also different from most types of cancer because it occurs and grows in connective tissue. The cancer cells grow in parts of the body that support or connect other types of tissue to the body. While the tumors can appear anywhere, they are most commonly found in the muscles, bones, cartilage, tendons, fat, and nerves. They are also seen in the blood vessels of the legs and the arms. There are over 50 types of sarcoma and they are divided into three categories, bone sarcoma, soft tissue sarcoma, and osteosarcoma. Who Is At Risk Of Developing Sarcoma? It is unknown exactly what causes sarcoma, however, there are certain risk factors that make it more likely for people to develop this type of cancer. Radiation exposure: If you had radiation to treat a previous cancer, you are more at risk. Family history: If a member of your family had sarcoma, your chances of getting it are higher. Genetic disorders: Certain genetic disorders such as retinoblastoma, neurofibromatosis, Gardner syndrome, or Li-Fraumeni syndrome put you at greater risk. Bone disorder: If you have the bone disease called Paget’s disease, you are at risk of developing sarcoma. Age: Children and young adults are more prone to developing an osteosarcoma. What Are the Symptoms of Sarcoma? In its early stages, sarcoma doesn’t show any symptoms. They can be hard to spot because they can grow anywhere in your body. If it is a soft tissue sarcoma, the first sign would be a painless lump. As it grows larger, it can press against the nerves or muscles causing pain. An osteosarcoma shows symptoms much earlier than the other types. There would be pain in the effected bone that comes and goes. Also, the pain is often worse at night. The area can also swell. What Is the Treatment For Sarcoma? Surgery: A doctor can perform surgery and remove the tumor from the body. It is possible for the doctor to remove the cancer cells, therefore, there would be no need for the effected limb to be amputated. If all of the cells cannot be removed, amputation might be your only chance of survivial. Radiation: If surgery isn’t an option, radiation is used. It can also kill any cells left behind after another treatment. Chemotherapy: Chemotherapy is used either with surgery or if surgery isn’t possible. It is also used if the cancer has spread. Targeted therapies: This is a relatively new treatment and the doctors use man made antibodies from the immune system. They are placed to block the growth of cancer cells without damaging any of the normal cells. What is the Survival Rate For Someone With Sarcoma? In most cases, soft tissue sarcoma can be cured with one surgery. If it is an aggressive tumor and the cancer has spread, it can be harder to treat. With osteosarcoma, if the cancer has not spread the survival rate is between 60 and 80 percent. If the cancer can be completely removed with surgery, the chance of a full recovery is excellent. If the cancer has spread to other parts of the body, the treatment would need to be more aggressive and the chances of being cured completely are much lower. Sarcoma is a rare and serious type of cancer. If it is caught early enough, the chances of survival are great. When it comes to your immune system, getting proper nutrition cannot be underestimated. The antioxidants, vitamins, and minerals you receive through your food are what keeps your body strong enough to fight off infection. It is important to make the following foods a part of your diet to ensure a good defense against colds and flu. It is a good source of zinc, and zinc aids in the development of white blood cells. These white blood cells improve both immune function and response. It’s protein supports the building of antibodies to fight off infection. Help reduce harmful inflammation in the body. Control chronic inflammation that can keep your immune system from working properly. Can prevent cold, flu, and more serious diseases. Is critical to fighting off colds and flu. Reduces the frequency and duration of colds and flu. If consistently taken, they will shorten the duration of a cold or possibly prevent it altogether. If cooked, they will shrink in size so you can consume more of them. Increases white blood cell production. Keeps the mucus membranes that line your nose, throat, and gastrointestinal tract, along with your skin, healthy. By keeping these membranes healthy, it builds your first line of defense against colds and flu. Raises the temperature in your airways, which loosens mucus secretions. Releases cysteine, an amino acid that resembles a drug used to treat bronchitis. Contains a high concentration of vegetables and protein that provide many different vitamins. Cause you to experience fewer and less severe colds. Promote balanced gut flora, which rids the body of viruses, bacteria, and toxins. Contain the most antioxidants when eaten raw. Is a probiotic food that replenishes this good bacteria. Lowers the risk of upper respiratory infections. Are a group of antioxidants that contain flu-fighting properties. Protect you from cancer and heart disease. Contains polyphenols that are disease-fighting antioxidants. Also contains a high concentration of zinc. Can be consumed daily if you stick to 1/4 ounce servings. With this abundant selection of immunity-boosting foods, we can enjoy better health during cold and flu season and all year around. Millions of people suffer with the autoimmune disease known as Lupus. This chronic inflammatory disease affects a person’s immune system. Rather than fighting to protect your body from viruses and bacteria, the immune system actually attacks various organs and tissues. Since, Lupus can affect different parts of the body, its symptoms vary greatly from person to person. The intensity of these symptoms also varies greatly, but most people experience flares, which will worsen and improve randomly. 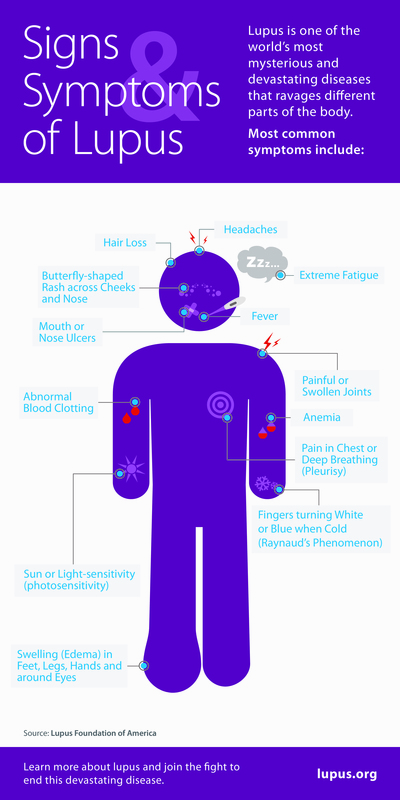 Below is a look at some of the main symptoms of Lupus. Anemia – Characterized by lower than normal levels of red blood cells in the body’s blood. Chest Pain – Chest pain that occurs when taking a deep breathe. This can be caused by an inflammation of the pleura membrane that surrounds the lungs, also referred to as Pleurisy. Dry or Swollen Eyes – Lupus can cause dry eyes or even swelling and pain in the area surrounding the eyes. Fatigue – Lupus oftentimes causes extreme fatigue that is typically more severe during and immediately after a flare. Fever – Many patients experience unexplainable fevers. Hair Loss – Depending on which organs and tissues are affected, Lupus may cause hair loss. Headaches – Many Lupus patient complain of severe headaches, which may be accompanied by confusion or even memory loss. Photosensitivity – Some Lupus patients also experience a sensitivity to the sun and the light. In these cases, it is best to avoid direct sunlight when possible. Rash – Many Lupus patients, but not all, experience a distinguishable rash on their face. This rash typically takes on a butterfly shape and spreads from the bridge of the nose outwards over both cheeks. Raynaud’s Phenomenon – This phenomenon causes a person’s fingers and/or toes to turn a whitish or bluish color when subjected to intense stress or extreme colds. Shortness of Breath – In addition to chest pain, Lupus patients may experience periods of shortness of breath. Skin Lesions – These types of lesions are most common among those whose Lupus affects their skin. Overexposure to direct sunlight should be avoided because this can worsen the lesions. Swelling – Lupus patients commonly show signs of swelling in their feet and legs. Unusual Blood Clotting – When Lupus affect the blood cells, a person may experience unusual blood clotting. Ulcers – Some people with Lupus also experience frequent ulcers in the nose and/or mouth. Lupus is sometime referred to as “The Great Imitator” because its symptoms are very similar to several other medical conditions, such as rheumatoid arthritis, thyroid problems and fibromyalgia. If you are experiencing any of these symptoms, you should schedule an appointment with your primary care physician to discuss these concerns. Deciding to eat healthier and making wiser food choices is a personal choice you alone must make as no one else can make this decision for you. Never before has America seen the level of obese people as there are in today’s society. If you are over 30 your ideal body weight you are considered obese, a hard word to admit. If you are over this 30, your weight you are considered to be “Morbidly Obese.” There are many reasons for our obesity problem, but the bottom line has to do with making the right food choices for the rest of your life, a lifestyle change. To eat healthier means to eat all the food groups in appropriate amounts and leaving the table feeling sufficiently full, meaning you do not exit the table with a “stuffed” stomach. Eating healthy has absolutely nothing to do with any diet. Eating healthy is a healthy state of your mind. Eating healthy never constitutes eating even healthy foods until your seams split in your clothes. Eating healthy means eating appropriate amounts of healthy foods. Eating healthy means a better blood pressure, decreasing risks for heart disease and diabetes. You reduce the chance of other diseases due to obesity. You have better chances of keeping your weight within an appropriate range for your body type and age. Keep your weight healthy by eating properly size meals. What Does Healthy Eating Constitute? The body requires some fat each day. Avoid saturated fats and turn to unsaturated fatty foods, for example, oily fish, and avocados. Healthy fats are necessary for healthy joints, hair, and skin. Sugars are contained naturally in some foods like fruits. Avoid white sugar, high fructose corn syrup and anything that relates to sugar (read food labels.) Too much sugar will help you gain weight; increase the risk for heart disease and diabetes. Too much sugar puts you at risk for other diseases. Control your meal portion sizes depending on your age, and activity levels. Eat fresh or fresh frozen foods and avoid canned foods that contain hidden sugars, and hidden sodium. Eat foods by baking, broiling, grilling, steaming. It takes a bit of common sense to eat healthier. Eating healthy is not a complicated matter or restrictive. 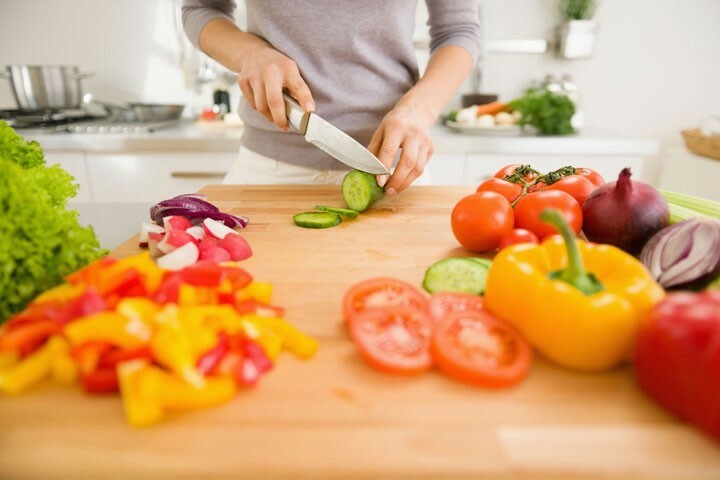 If you eat foods from mostly plant sources like fresh or frozen vegetables, fruits, whole grains and strictly limit your processed food choices, and red meats, you are feeding your body healthier. Add to your healthy lifestyle, eating a doctor approved, daily exercise routine. There is more to dehydration than just being very thirsty. When your body doesn’t get enough water, it cannot function properly. When you become dehydrated, it can be mild or severe. It all depends on how much fluid is missing from your body. It is normal to lose water throughout the day. It can happen when you sweat, when you cry, when you go to the bathroom, and even when you breathe. There are certain situations where you can lose too much water, and it can become a hazard to your health. Diarrhea: When you have diarrhea, your intestinal tract cannot absorb water from the foods that you eat. Over time, this can result in severe dehydration. Vomiting: If you have the flu or food poisoning, excessive vomiting can make it impossible to keep food and liquids down. This can quickly result in dehydration. 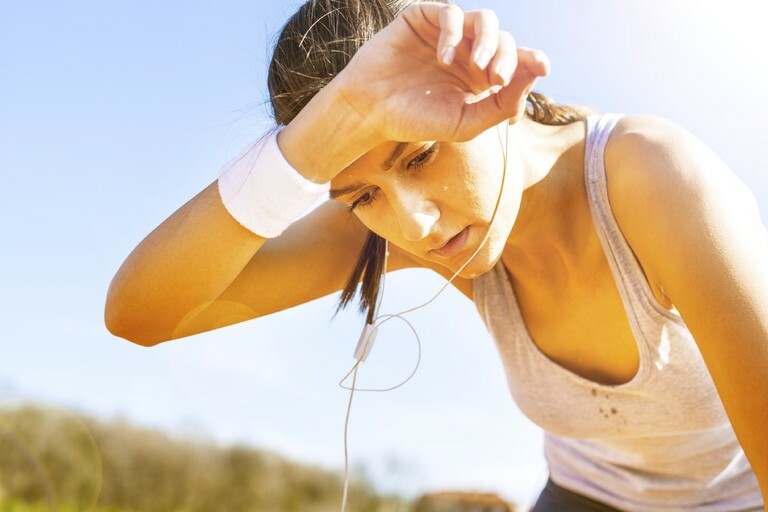 Excessive sweating: If you are sweating excessively, whether it be due to a fever, intense exercise, or being out in the hot sun, you can lose more water from your body than you can put in. This can quickly result in dehydration. Frequent urination: There are certain drugs that can cause you to urinate frequently. Drinking an excessive amount of alcohol can also cause you to urinate excessively. This can cause you to become seriously dehydrated. The treatment for dehydration would depend on how dehydrated you are. If you are experiencing symptoms of mild dehydration, you would just need to sit down in a cool area and drink water. It can take drinking two quarts of water over a period of two to four hours to replenish the fluids that you have lost. If you are suffering from symptoms of severe dehydration, you may need to seek medical assistance. In severe cases, you may not be able to get the amount of water that you need in your body fast enough by drinking alone. In severe cases, you should go to the hospital where you would be given IV fluids for several hours until you have replenished the water in your body. Preventing dehydration is much safer than becoming dehydrated and then needing to treat it. There are several ways that you can prevent dehydration. Try to drink 8 to 10 glasses of water each day. This will keep hydrated. If you are vomiting, have a fever, or if you have diarrhea that lasts for longer than a day or two, seek medical attention. You may need IV fluids to keep from becoming dehydrated. If you are going to be outside in the hot sun, bring along enough water. Try to drink 10 ounces of water every 30 minutes. Drink water while you are exercising. Dehydration can be very dangerous and in some cases, deadly. It is important to know the signs of dehydration and what you should do if you beleive that you are becoming dehydrated. Allergies make thousands of people miserable in a day. We don’t even fully understand why our bodies bother to stir up such an uncomfortable reaction. Even though scientists and immunologists don’t have an exact explanation as to why we have allergies, the basics to this pertinent issues exist. The haze might still be there but scientists believe they have uncovered a molecular reason that could drive human allergic reactions. 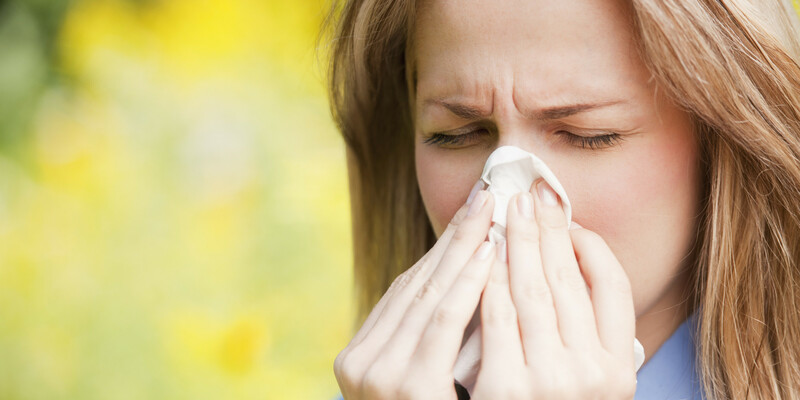 Allergies are otherwise immune reactions gone wrong. They will upset the stomach, activate sneezing, lead to skin rashes or even lead to catastrophic anaphylactic shock. The reaction occurs when your immune system detects a foreign body and activates a series of reactions meant to remove that foreign body from our system. This is a normal reaction that occurs when the body detects germs and pathogens only that the allergen in this case would be relatively harmless to the body. It could be as simple as pollen, dust or egg protein. When the allergen enters the body, your plasma cells release immunoglobulin E antibodies specific to that allergen. These antibodies make their way to mast cells located in areas like your skin and the mucous membranes. These cells are in charge of inflammatory responses that improve the way your body reacts to foreign objects. The other time your body encounters the allergen, the Mast Cells will release histamines, prostaglandins and leukotrienes, cells that will in turn trigger a wide range of allergic reactions whose sole purpose is to get rid of the allergen before it gets deeper into your body. So far, the best way to fight an allergic reaction is by taking specific antihistamines that will cool down the rate at which the body reacts to the allergen. Scientists are yet to devise a fool-proof way of fighting allergens that will make you immune to that specific compound that gets your immune system tripping. Most people opt to keep of their triggers in order to avoid allergic reactions. Stocking a couple of reaction specific antihistamines also seems to be a great way to come prepared since most of the allergens are almost inevitable. Apart from this abstinence and medical intervention, there are other medicine free approaches that help people with allergic reactions live an almost normal life. If you are not allergic to honey, you can use it to accustom your body to pollen and reduce asthma or allergic reactions to pollen. Locally produced and unprocessed honey is the best. Use it sparingly until you are sure your body can tolerate it. Acupuncture is a mythical treatment procedure that delivers results. Weekly acupuncture treatments can lead to fewer breathing problems and could be a great way out to people allergic to pollen. A healthy diet and healthy living gives you more wiggle room. A research proved that junk food is directly related to allergies and asthma especially in kids. Allergic reactions don’t have a perfect cure. The best you can do is mitigate the effects and be ready to appease the symptoms once they kick in. At least this will be our way around these unwanted and uncomfortable immune responses until doctors and scientists find a way to teach our bodies that allergens aren’t as harmful as it thinks they are.